There’s no single type of plumbing clog, and therefore there is no one way to prevent one. And you can trust us when we say that our plumbing professionals have handled them all. In fact when most people think of “plumbers,” the first job they often think of is drain unclogging. Of course, we do a lot more than just unclogging drains—we even offer a lot more than just plumbing services—but yes, drain clogs are the most common plumbing hassle we deal with. The reason for this is because there are so many different things that can cause a clog to start, depending on the area of the home it occurs in. The best way to avoid plumbing clogs is by knowing what some of the most popular causes are. Read on to learn more! Your bathroom drains are no stranger to hair. Whether it’s the sink, shower, or bathtub—these drains often draw in a lot of loose hair! The strands get stuck in the p-trap, which is the curved section of pipe beneath your sink. Once the hair gets lodged in there, it begins to ensnare other hair and debris, leading to a tangle that can slow down or even stop up the drain. These clogs can be tough to clear out thoroughly, which is why we recommend you contacting a pro to do so. The best way to prevent this clog in the first place is to use a drain cover to block the hair, and throw away the hair at the end of your shower, etc. Alright, so, you can’t stop soap from going down the drains of your plumbing system. And if you’ve ever tried to clean soap that has gotten caked onto a soap dish, you have an idea of how touch and obstinate its build-up can be. 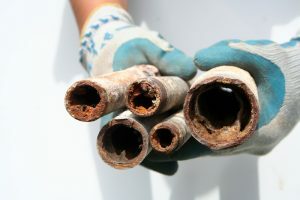 Not only does soap scum threaten to clog your drain, but it can also create reactions within the pipe material leading to corrosion (this is because soap scum and lime-scale buildup is caused by hard water, which we’ll get to below). Speaking of reactions, the reason you should never try to use store-bought chemical drain cleaners in your home is because they, too, can and will cause corrosion in your pipes, leading to premature plumbing repair and potentially even plumbing replacement. This one is a kitchen sink problem. Many homeowners have garbage disposal systems in their kitchen sink, and assume that covers anything you’d put down your drain. This just isn’t the case, however. Not only are their food items that can actually damage your garbage disposal, like fruit pits or fibrous vegetables like celery, but there are some that simply bypass the garbage disposal system altogether to create a clog—like FOG. FOG stands for fats, oils, and grease. What happens is that these food byproducts harden as they cool. And since they cool in your sink drain after you pour it down, this pretty easily accumulates into a clog. Solving a clogged drain on your own can be a frustrating process. But the good news is, you don’t have to do it alone! Our team is standing by and ready to help with professional drain cleaning and/or more prevention tips. For quality Tampa, FL plumbing services, look no further than IERNA’s Heating & Cooling. Contact us today!